Mixing narrative descriptions with an easy-to-use template presentation, this book introduces you to hundreds of useful, free resources on the web to locate factual information. Since 1999, the authors of this book have trained thousands of people to use the Internet more efficiently in their practice, in hundreds of custom-designed seminars for law firms, bar associations and companies to help legal professionals learn about the latest online research resources. 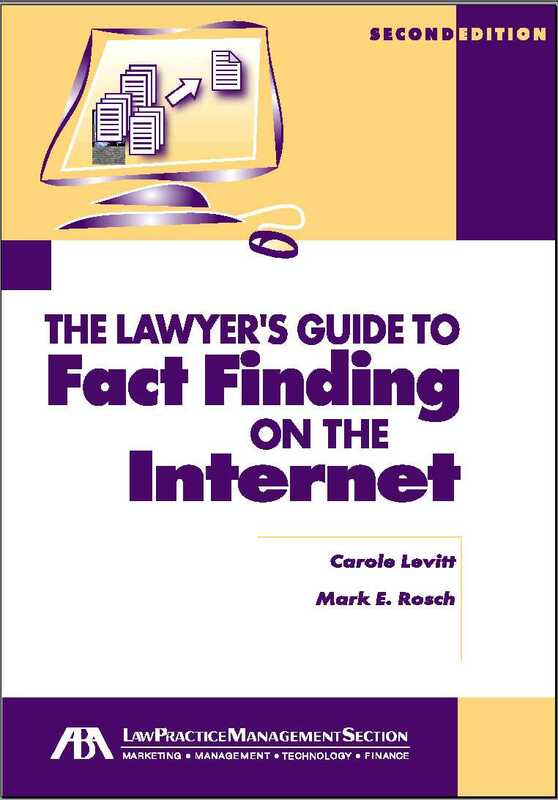 Click here to order your copy of "The Lawyer's Guide to Fact Finding on the Internet now. Rosch provides Electronic Marketing Consulting services to solo practitioners and law firms of all sizes that seek to create an online marketing effort or increase the effectiveness of their current efforts. Mr. Rosch has also helped law firms and legal consultants optimize their web sites to improve their Search Engine rankings. During his 16 years of marketing experience, Mark Rosch has developed, implemented and supervised the publicity, promotions and marketing campaigns for numerous and varied clients, from LLRX.com, the prestigious legal web site, to new media developers. Currently he provides web management consulting to the State Bar of California Law Practice Management & Technology sections web site. He has written on the subject of building and managing effective web sites for the Legal Marketing Association and Los Angeles Lawyer magazines. Mr. Rosch has also written about the application of computer technology in the law office for Law Office Computing, Los Angeles Lawyer and the Los Angeles Daily Journal among other publications. Rosch has presented at the Annual meetings of the ABA, the National Association of Bar Executives, the Association of Continuning Legal Education, the California State Bar and and in-house at various firms. Previously, as Vice President, Public Relations for E! Entertainment Television Networks, he was responsible for developing and supervising all publicity strategy and its implementation for the E! Entertainment Television cable network, as well as the companys newest network, Style. Prior to E! Mr. Rosch was Vice President of the Weissman/Angellotti public relations firm, working on numerous projects, including all television specials, events and activities of the Academy of Television Arts & Sciences (including the Primetime Emmy Awards), network television specials, new media projects including the launch of the TV Academy's first website in 1995, as well as numerous feature films including "Like Water For Chocolate." Mr. Rosch is a member of the Association of Continuing Legal Education (ACLEA) and the ABA, in addition to serving as a member of the Board of Directors of the Entertainment Publicists Professional Society. He has also served as a member of the Academy of Television Arts & Sciences' Public Relations steering committee, the Television Publicity Executives Committee and the American Film Institute. He was graduated from Tulane University, in New Orleans, with a B.A. degree in Sociology. Mr. Rosch can be reached at mrosch@netforlawyers.com.